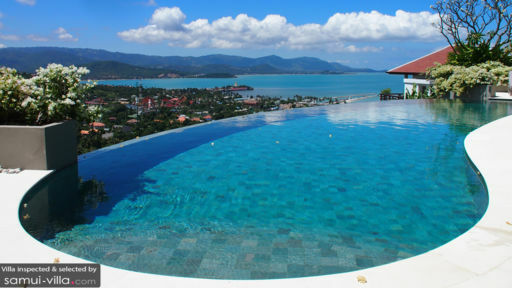 As its name suggests, Panorama Summit Villa offers stunning panoramas of its scenic surroundings.The luxurious villa sits within the exclusive Samui Summit Estate, along the north eastern coasts of the island. Commodious and contemporary, this vacation home is ideal for travellers seeking an unforgettable holiday in a tropical paradise. Five commodious bedrooms offer accommodation for ten guests. Floor-to-ceiling sliding doors bring in plenty of natural light and breeze into the rooms, which also offers snug spots perfect for a quiet afternoon of reading or relaxation. Both master bedrooms contain en-suite bathrooms, wood flooring and private terraces filled with a tasteful selection of outdoor furniture. Panorama Summit contains two twin en-suite guest rooms. 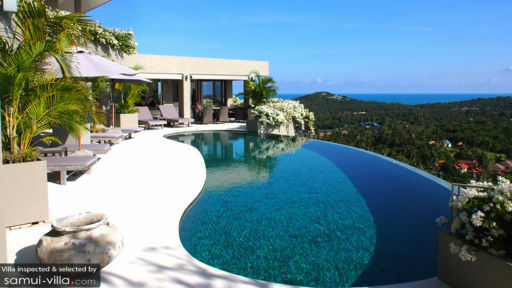 A fifth bedroom, opening out to the pool deck, is nestled away in the west section of the villa. Guests will find plenty of spaces perfect for rest and relaxation outdoors. Sun seekers may take their pick from lounging at the upper floor terrace or upon one of the sun loungers lining the pool, or taking a dip in the refreshing waters of the infinity pool. When the heat becomes unbearable, seek shelter under the cool shade of the covered relaxation area. Outdoor dining is a non-negotiable option at Panorama Summit. Why take your meals indoors, when you can dine alfresco against a backdrop of breathtaking coastal scenery? The dining table at the pool terrace serves offers an excellent spot for an enjoyable meal, for it is shaded from the glare of the sun in the mornings, and overlooks a captivating sunset view during the evenings. 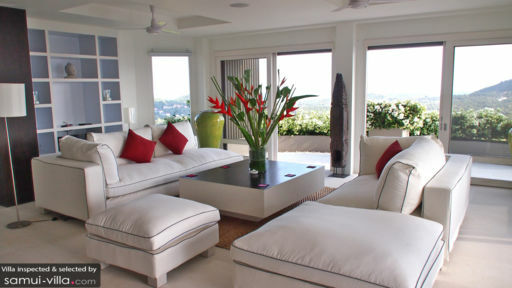 The spacious living area connects the lounge, kitchen and dining spaces of the villa. The interiors, dressed largely in monochromatic hues, exude vibes of stylish chic. Asian accents are found in a fine selection of oriental ornaments and Javanese stone flooring, and the expansive sliding doors provide easy access between the living area and sun deck. A pillowy built-in sofa and scatter cushions in the TV room offers a comfortable setting perfect for a movie marathon. Panorama Summit offers housekeeping services, security services, daily breakfast service, airport transfers and welcome drinks. A baby cot is available for use free of charge. Amenities available at additional cost include personal chef services, child minding services, personal driver services, boat rental, car rental, bicycle rental, laundry service and in-villa massages. Soak up the zen-like atmosphere of Panorama Summit Villa’s serene hilltop location, and admire the alluring sunrise and sunset views each day. A quick drive, lasting a handful of minutes, will bring vacation makers to a variety of nearby beaches filled with restaurants, bars, spas and luxe five-star hotels. Renowned attractions, such as Chaweng and Fisherman’s Village, are a quick ten minutes’ drive away. The stay was wonderful. We think it was the best yet. The pool was lovely, the beds were really comfortable, and most of all, the family had a great time! Some of us are from New York, you don't get something like this in either places. We hoped to stay longer but we will come back very soon.